SDAO 2013 A NNUAL C ONFERENCE MAKING EXECUTIVE DIRECTOR PERFORMANCE EVALUATION MEANINGFUL Presented by Judy Clark, SPHR HR Answers, Inc.
1 SDAO 2013 A NNUAL C ONFERENCE MAKING EXECUTIVE DIRECTOR PERFORMANCE EVALUATION MEANINGFUL Presented by Judy Clark, SPHR HR Answers, Inc.
2 S ESSION O BJECTIVES Discuss the benefits of the evaluation process. Review the elements of a good evaluation process. Explore different ways of conducting an evaluation. 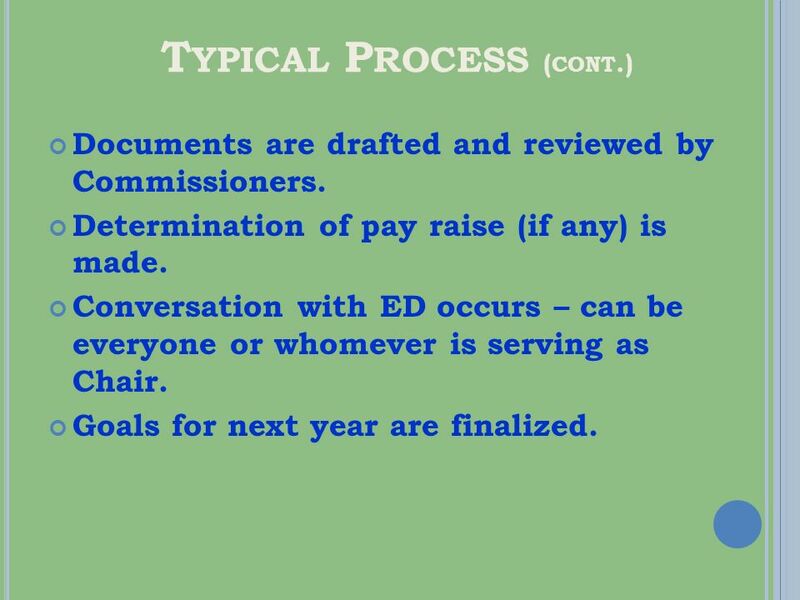 Examine documents helpful to the evaluation process. Address questions from attendees. 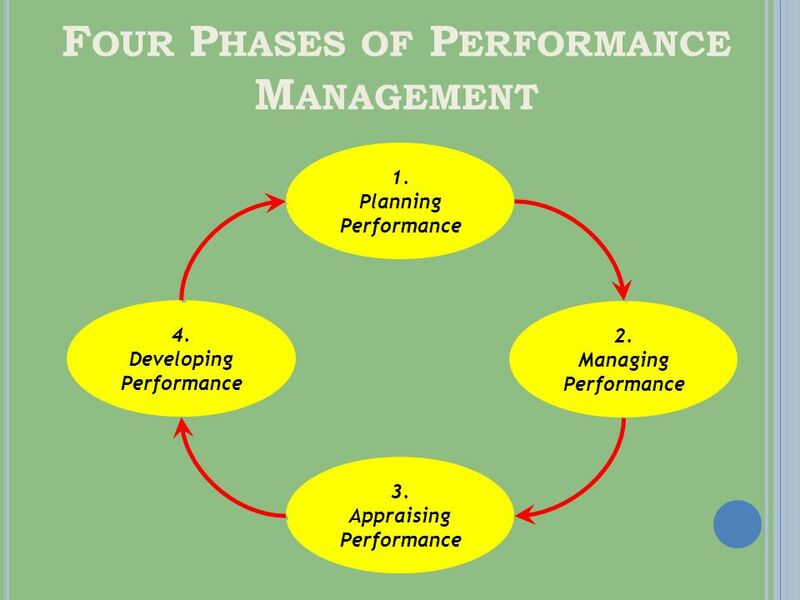 3 U NDERSTANDING THE E VALUATION Evaluation is the process of reviewing past performance and planning for future performance. 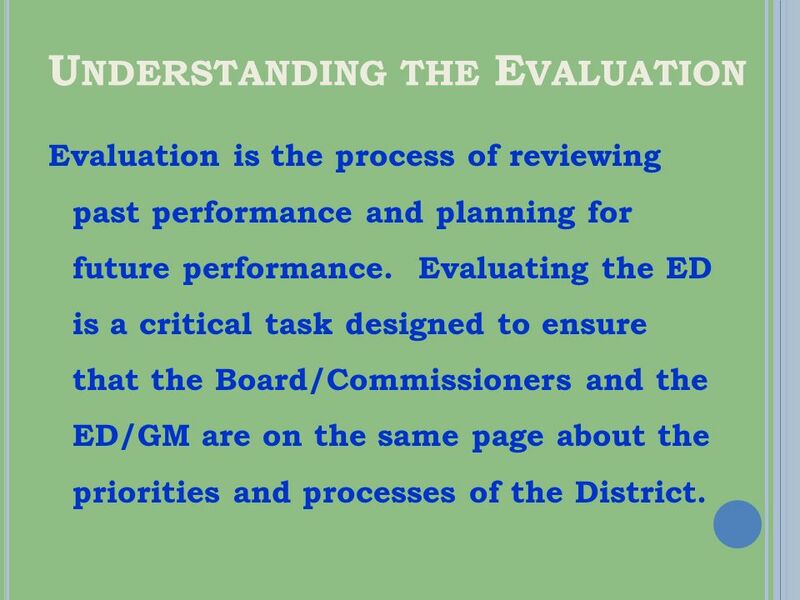 Evaluating the ED is a critical task designed to ensure that the Board/Commissioners and the ED/GM are on the same page about the priorities and processes of the District. 4 B ASIC O RGANIZATIONAL M ANAGEMENT P RINCIPLES Let people know what is expected of them. Give them a chance to perform. Give them help when and as needed. Let them know how they are doing, eliminating surprises. Recognize and reward them on their results. 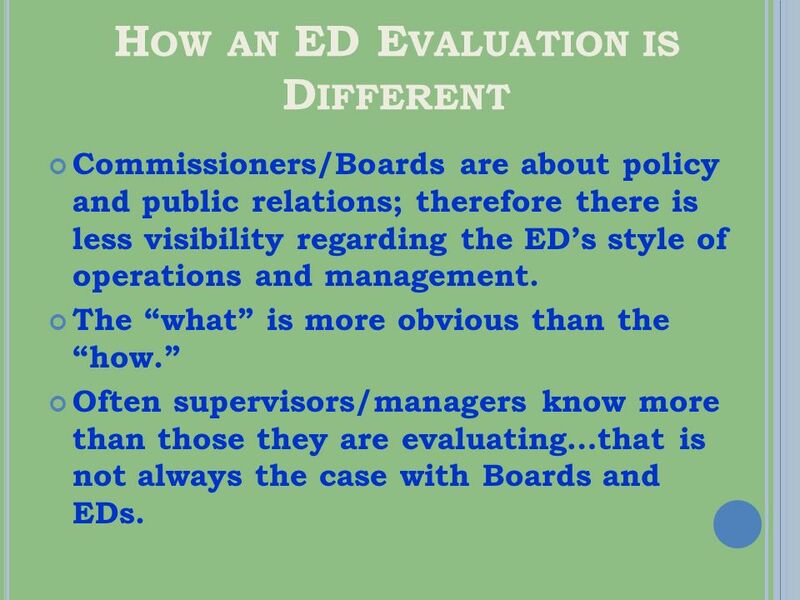 7 H OW AN ED E VALUATION IS D IFFERENT Commissioners/Boards are about policy and public relations; therefore there is less visibility regarding the EDs style of operations and management. The what is more obvious than the how. Often supervisors/managers know more than those they are evaluating…that is not always the case with Boards and EDs. 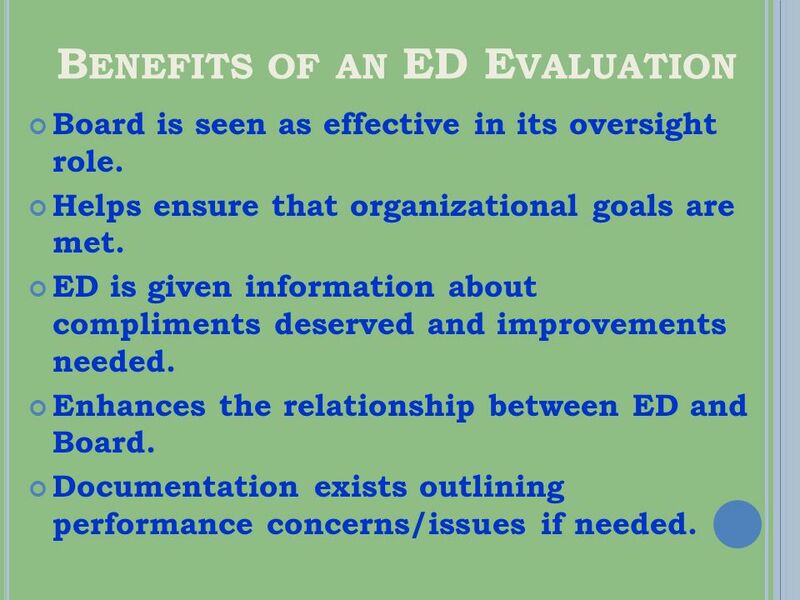 8 B ENEFITS OF AN ED E VALUATION Board is seen as effective in its oversight role. 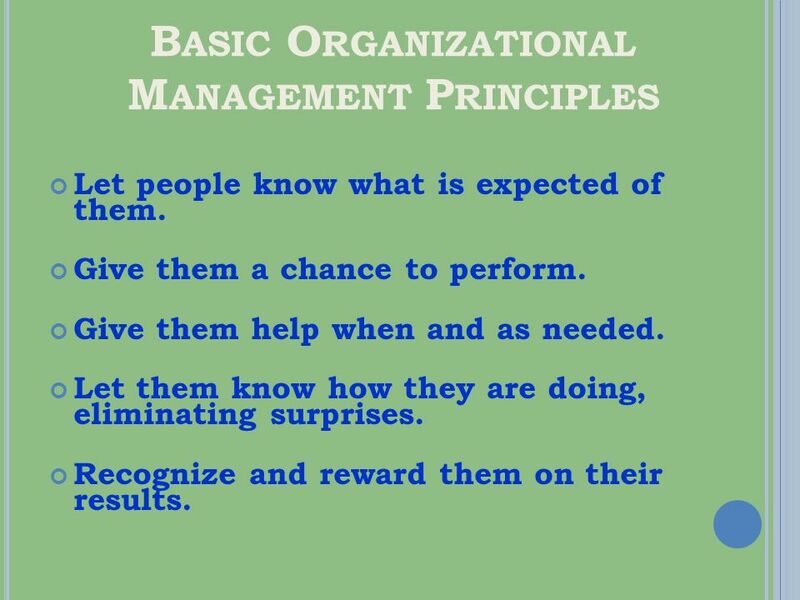 Helps ensure that organizational goals are met. 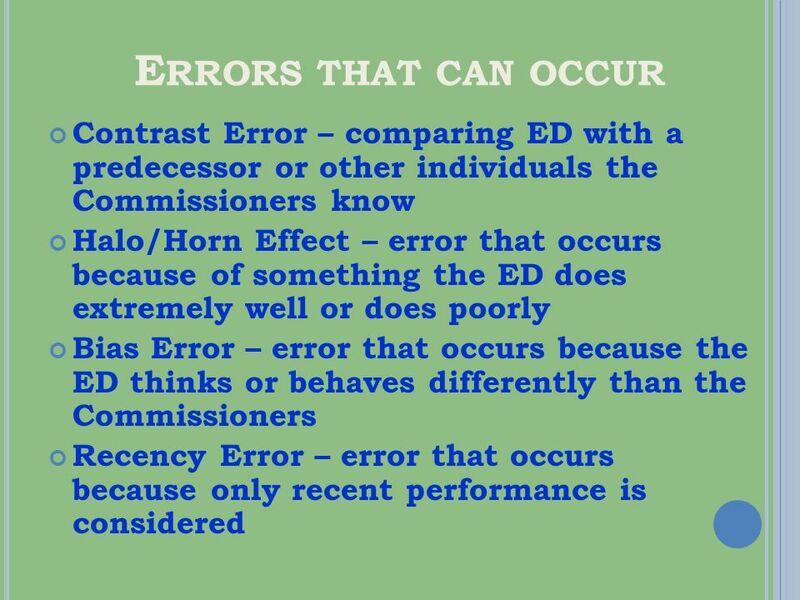 ED is given information about compliments deserved and improvements needed. Enhances the relationship between ED and Board. Documentation exists outlining performance concerns/issues if needed. 10 T YPICAL P ROCESS ( CONT.) Documents are drafted and reviewed by Commissioners. Determination of pay raise (if any) is made. 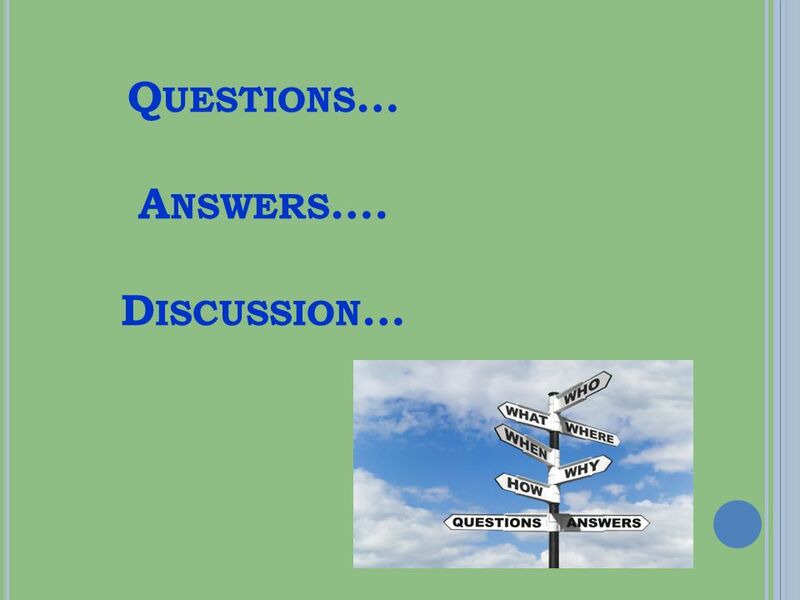 Conversation with ED occurs – can be everyone or whomever is serving as Chair. Goals for next year are finalized. 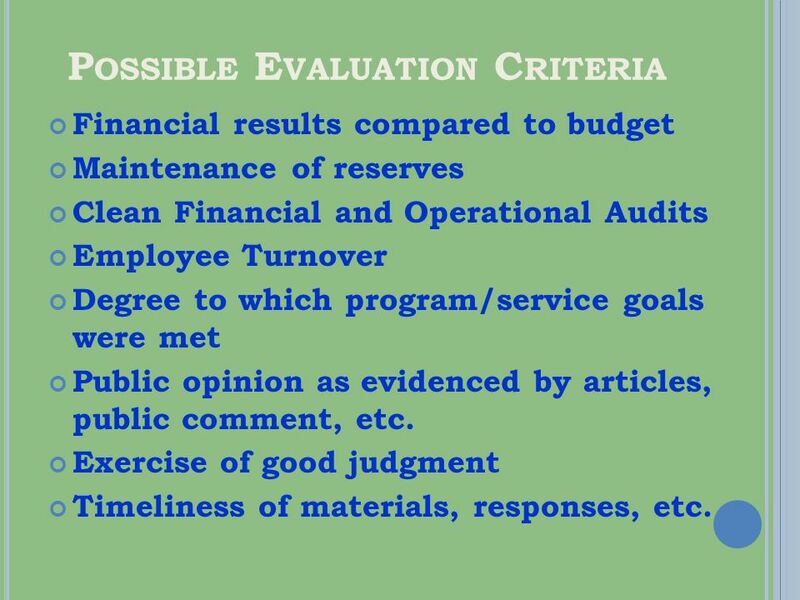 12 P OSSIBLE E VALUATION C RITERIA Financial results compared to budget Maintenance of reserves Clean Financial and Operational Audits Employee Turnover Degree to which program/service goals were met Public opinion as evidenced by articles, public comment, etc. Exercise of good judgment Timeliness of materials, responses, etc. 13 P OSSIBLE E VALUATION C RITERIA ( CONT.) 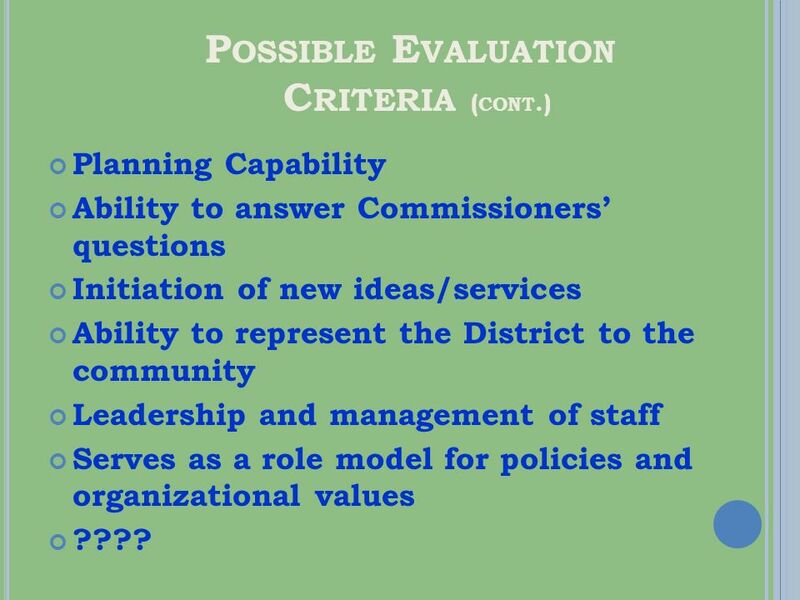 Planning Capability Ability to answer Commissioners questions Initiation of new ideas/services Ability to represent the District to the community Leadership and management of staff Serves as a role model for policies and organizational values ???? 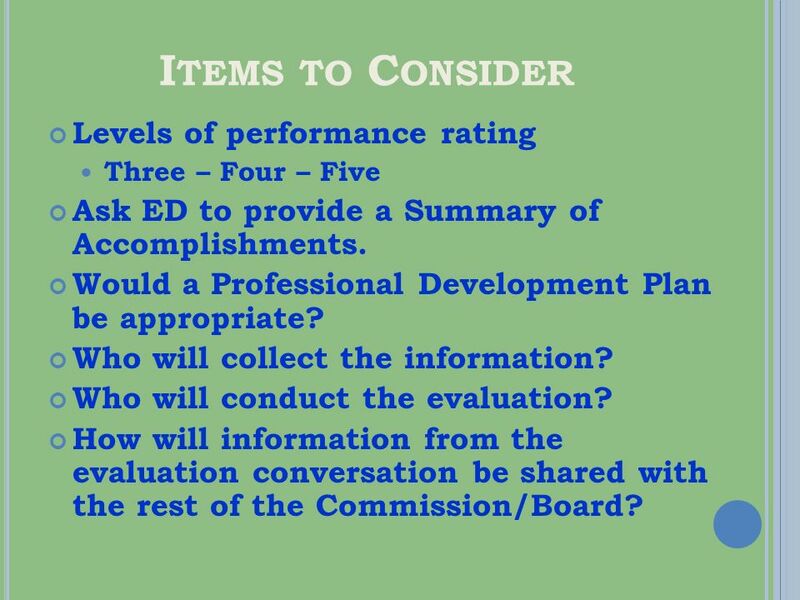 15 I TEMS TO C ONSIDER Levels of performance rating Three – Four – Five Ask ED to provide a Summary of Accomplishments. Would a Professional Development Plan be appropriate? Who will collect the information? Who will conduct the evaluation? 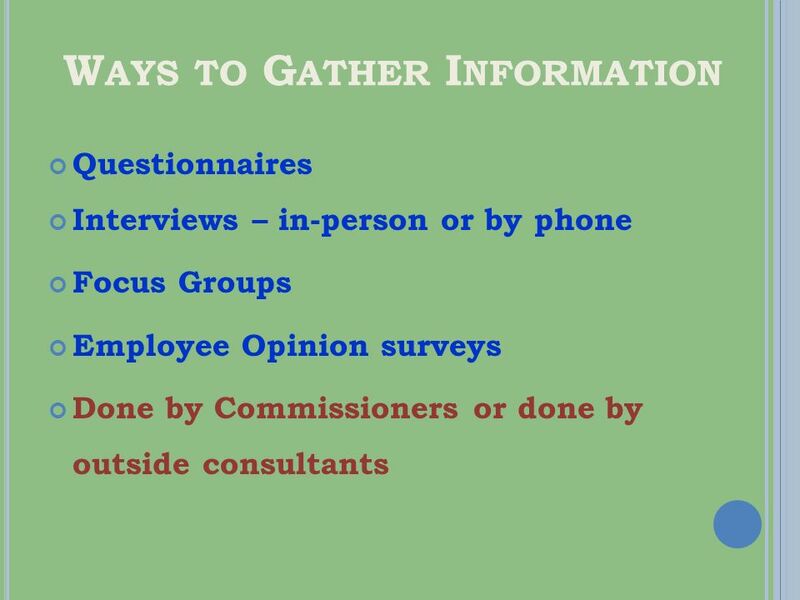 How will information from the evaluation conversation be shared with the rest of the Commission/Board? Download ppt "SDAO 2013 A NNUAL C ONFERENCE MAKING EXECUTIVE DIRECTOR PERFORMANCE EVALUATION MEANINGFUL Presented by Judy Clark, SPHR HR Answers, Inc."
Facilitator:Colleen Kelly December 14, 2012 Governance Lab Session 4: Evaluating Your ED/CEO. Dimension 5: Treat Employees Responsibly With Alia Farhat of Al Majmoua and Leah Wardle of the SPTF. Prince George’s County Human Services Coalition Funders Panel Presenter: Renette Oklewicz Director, Foundation Programs January 11, 2012. Auditing the HR Function Kelli W. Vito, SPHR, CCP KV Consulting. 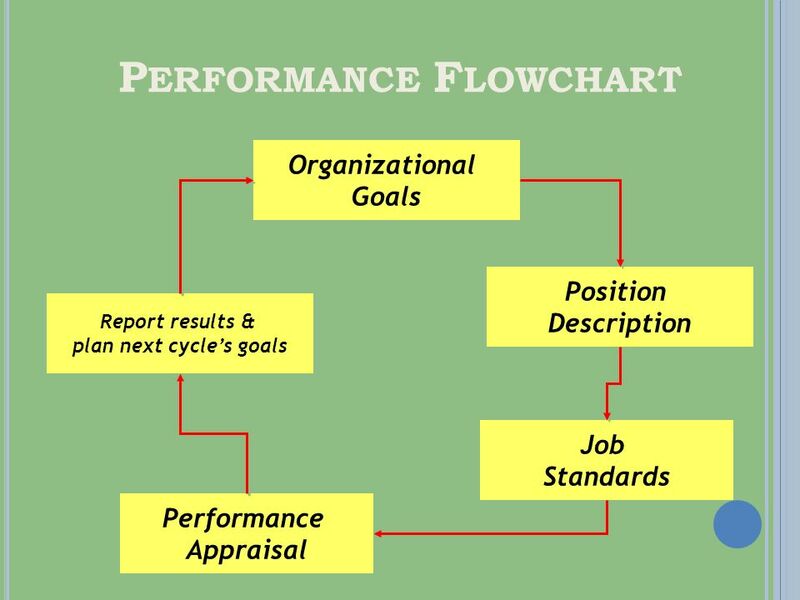 Performance Assessment Process: The Employee’s Perspective May 2014. 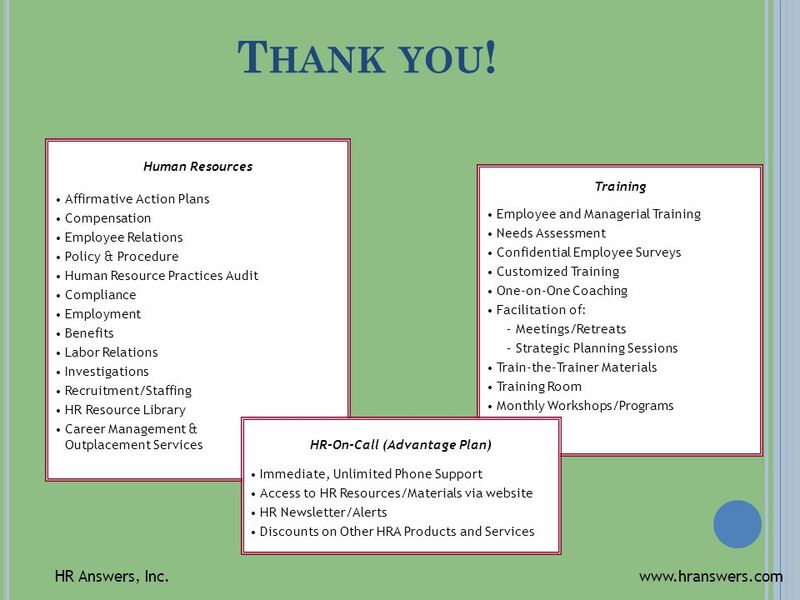 1 Introduction to Workforce Planning and Development in State of Alaska Executive Branch Departments. 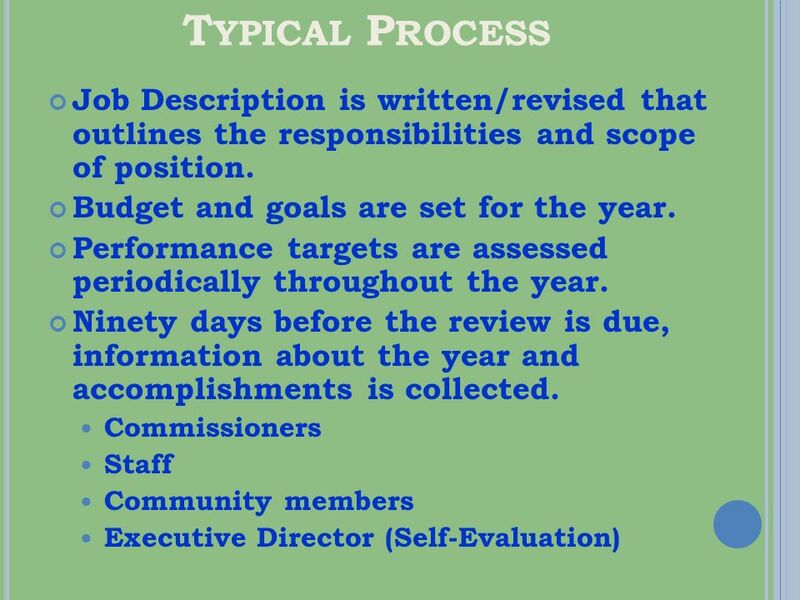 Orientation to the Accreditation Internal Evaluation (Self-Study) Flex Activity March 1, 2012 Lassen Community College. Retention Strategies: Keeping the People You Want To Keep Kay Robinson, SPHR Robinson HR Consulting, Inc. Erin Ulery Director, Professional Development. Management of Community Nutrition Services Chapter 19.